By now you’ve probably seen the Animated Track Map of the track at the Red Bull Lake Elsinore National, but if you’re like me, you’re itching to know more details about the newest track of the Lucas Oil Pro Motocross Championship. That’s why I called track builder Marc Peters, the same man responsible for High Point and Steel City, to get the details. 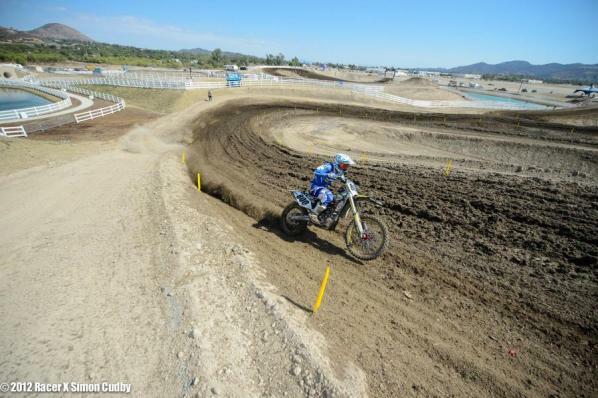 Racer X: How’s the track prep going? Marc Peters: The track is coming along really cool. We’ve done a lot of work in the last two weeks, and I think people are going to be pretty excited when they see the new layout and what we’ve done with the obstacles. We’ve also put about 150 truckloads of mulch into the dirt, and it’s going to be very rutty, and it’ll probably get really rough. Did you put any sand down? Is the track going to be completely brand new, or will it incorporate sections of any existing track? This is a brand new track. It kind of started off not being a new track, but I got the track map and we started talking about it, and we decided to flip it around. So we’re going backward on the existing track, but we’re going forward on some of the stuff. It’s pretty cool, and it’s been exciting seeing every stage of it. It looks amazing right now, and the dirt is choice. Mike Alessi at press day riding the new layout. So it’ll be different enough that the guys who ride there on a regular basis won’t have any type of advantage? They won’t have any advantage. It’s Elsinore dirt, but like I said we brought in all that mulch, which has a lot of fiber in it and it’s going to hold moisture really well. We’re running it in the Lucas Oil track, and there’s a lot of elevation. If you add up all the elevation, you’re probably going to be looking at 200-300 feet of elevation change. It goes up and down, there’s some off-cambers, there’s some big, hip double jumps, turning rhythm lanes, fast sweepers and big horsepower straightaways. I think it’s going to work out good for all the bikes. I think the amateur day is going to be pretty cool too in the way that we designed it. They’re going to be racing pretty much the same track. We might take out some stuff, because the track is going to be pretty big, it’s probably going to have about 2:40.00 lap times. There’s a lot of real estate! How about the viewing areas? It’s going to be cool. There are so many cool features on this racetrack, I think people are going to be wanting to move around the whole time. With the new RV parking, I think it’s great. There’s already people parking their motorhomes here. It’s like NASCAR, they’re right up against the racetrack. 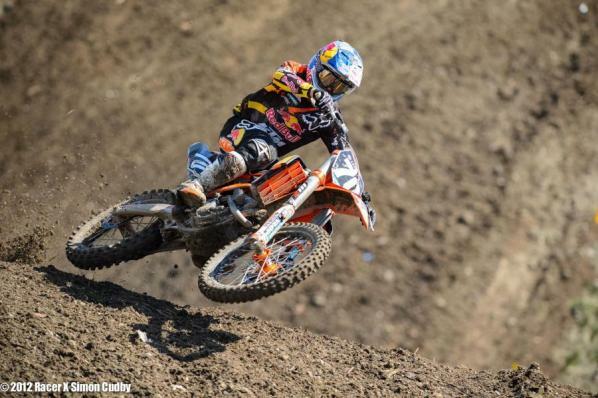 Ken Roczen was also out at Elsinore putting down some laps. If you could name the single most unique aspect of this track, what would it be? The design that I came up with is pretty unique because of all the variables. It runs into the truck track, and coming off the truck track we’ve got some pretty big elevation changes. The tabletops are over 120 feet long! This track is unique, and that’s my whole style of building. I like building tracks that have flow, and I really think this track is going to be different than the rest of the tracks because of the unique area and the landscape. It’s got a bunch of lakes and trees around, and jumping into the Lucas Oil off-road track, you’ve got some killer bleacher seating and you’ll be able to chill with your family watching racing. I hope everybody comes out and enjoys the track. I think the pro guys will be pretty excited. Everyone at Elsinore, MX Sports, myself, Chad Rozanek and Jeff Russell, we all worked pretty hard on this track to make it come alive. We’re all excited, and everyone is running around like kids. Without a good team it’s hard to pull stuff like this off.